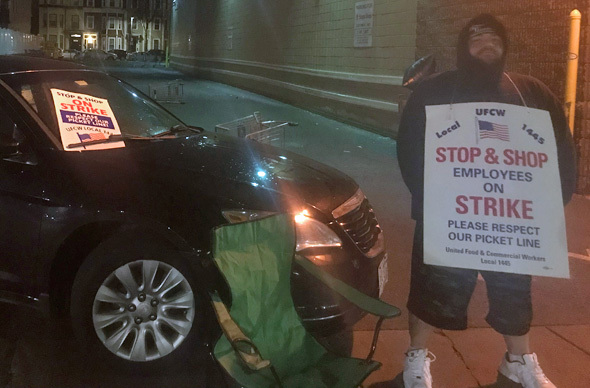 On strike on Truman Parkway in Hyde Park. 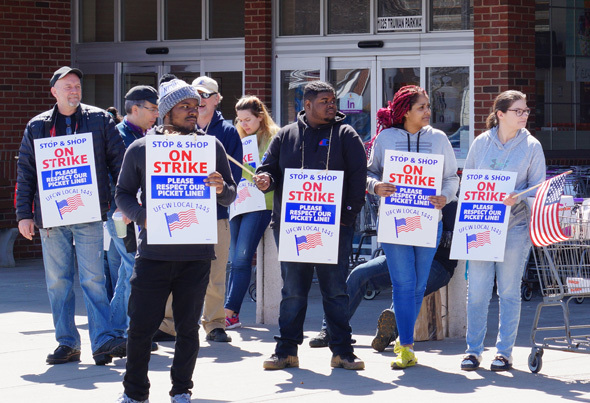 At 1 p.m., the United Food & Commercial Workers declared a strike against Stop & Shop across New England. 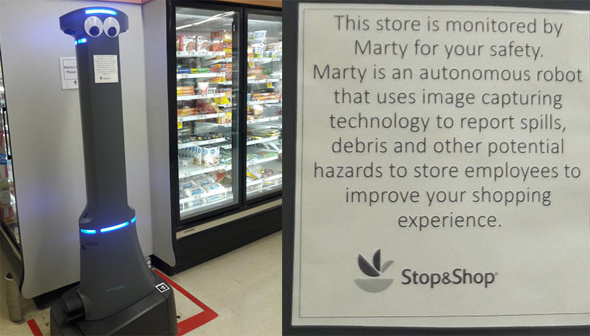 As workers walked out of stores, managers, with nobody left to do any work except for Marty the Spill Finding Robot, shut the stores and associated gas stations. Read more. Police in Stoughton are looking for a guy who managed to sneak 22 or so bottles of Tide out of the local Stop & Shop without paying for them. 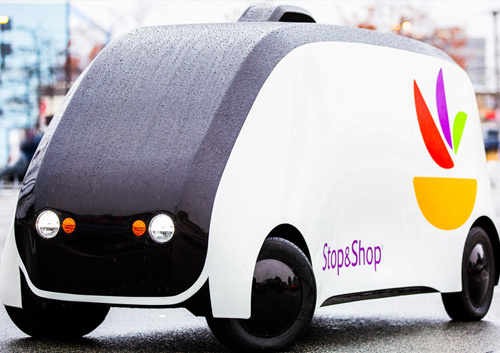 The Washington Post reports a googly-eyed robot named Marty is now roaming the Stop & Shop in Seekonk, reporting spills and other problems - via a control center in the Philippines - at least until somebody knocks Mr. Smartypants over in a fit of rage or it kills itself like that robot in DC because people keep calling it Mahty or because it quickly despairs of its spending its life searching for fallen price signs. 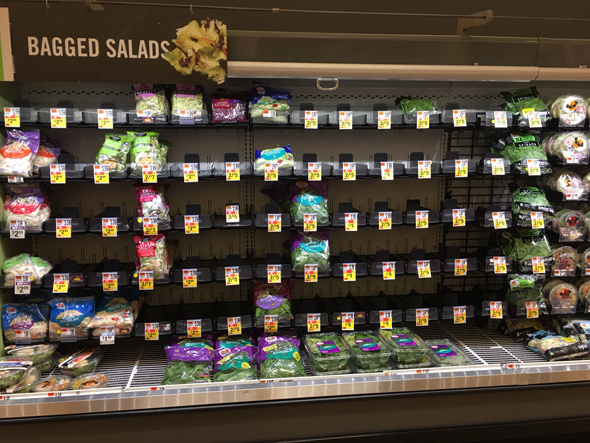 Roving UHub leafy-greens photographer Jed Hresko reports the romaine was just the tip of the iceberg at the Jamaica Plain Stop & Shop tonight - they also rooted out the arugula. H/t Ana Crowley for the headline. 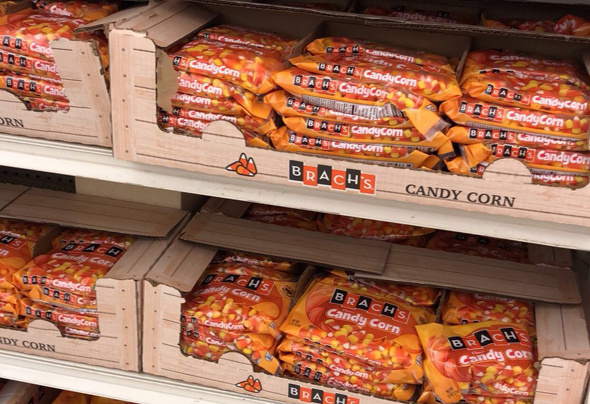 Andrew Applegate reports the Stoneham Stop & Shop had Halloween candy out yesterday, which, let's check the calendar here, was July 18. Police are looking for a guy who walked out of the Stop & Shop on American Legion Highway in Roslindale with about $125 worth of purloined frozen shrimp around 3 p.m., then pedaled away on a mountain bike towards Hyde Park Avenue. At these temps, he probably had to hurry. A man now driving an Infiniti stolen from Herb Chambers in Allston has robbed the Citizens Bank branch inside the Everett Street Stop & Shop twice now - and has also knocked over Citizens Bank branches in Stop & Shop stores in Somerville and Revere, the FBI's Bank Robbery Task Force reports. Read more. If you celebrate Passover and live anywhere near Dedham, you probably know that the Dedham Stop & Shop has a pretty large Passover-food section - everything from kosher-for-Passover coconut milk to, of course, all sorts of matzoh (they've got shmurah matzoh, gluten-free matzoh and triangular matzoh with which to make pizza matzoh). But there is one item they have this year that is completely unnecessary, in fact, kind of an abomination: Matzoh brei in a box. Read more. 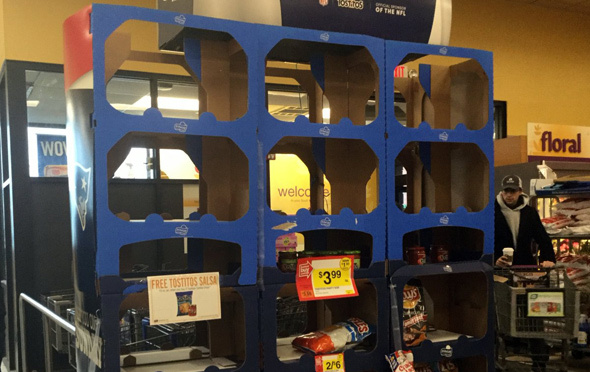 Right now, you can split Boston-area supermarkets into two groups: The bunch where they have plenty of bananas and the ones where, yes, they have no bananas. Read more. 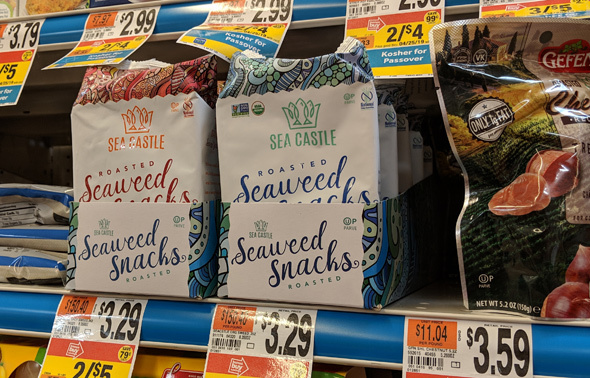 Eileen Murphy shows us the state of one chips display at the South Boston Stop & Shop around 4:30 p.m. She reports: Read more. Stop & Shop and New England Development recently filed their formal plans to turn the current Stop & Shop property on Everett Street in Allston into "a vibrant mixed-use neighborhood focused on healthy living and eating," with up to 1,050 apartments and condos, a state-of-the-art "urban-style grocery store," office and retail space and a half-acre "community green." Read more. 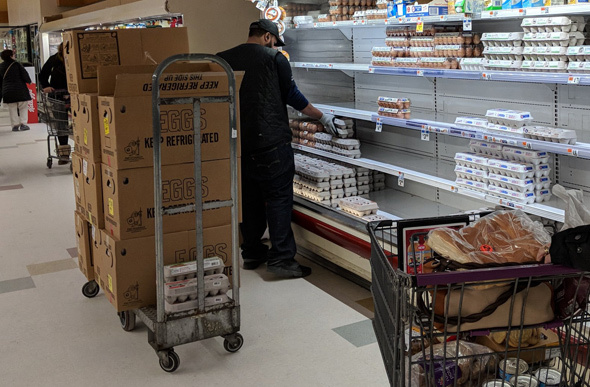 The eggman got to the egg case at the Dedham Stop & Shop just in time, in this case around 4:30 p.m. The store was pretty crowded, as were the Star Market and Roche Bros. in West Roxbury.